Take a note -- Advanced Directing is no longer offered; directors must take senior thesis (same 3 credits) for graduation. Consult your advisor! If you major in Directing, you will have extra assignments in this class. Highly recommended that you take THR215 Dramatic Literature Class before enrolling in this course! After 2009 : classes.vtheatre.net Live Students! Please go to: http://classes.uaf.edu + Log in to Blackboard, choose "THR 190 / Auditions and Portfolio Review" and complete the online Outcomes Assessment form under the "Assignment" tab. Please read all three plays right away as they will be used as examples throughout the course. Recommend: ACTING in Person and Style, by Jerry Crawford (Check "Actors on Acting" THR 221 Intermediate Acting Textbook). First Scene: a short scene from Hamlet, Inspector General or Three Sisters directed with the Intermediate Acting students (THR 221) for the Midterm. PRODUCTIONS CRITIQUE REQUIRED: You are required to see the shows of the Spring season, select one for your directorial analysis. You are required to write one critique which must be submitted before the discussion in class. (see a critique checklist/format in THR 331 Master File). Week 1 1/17: Intro, History, Functions. Spectatorship. Theory: Begin Script Analysis. Review Aristotle's "Poetics". Idea(s) into Concept. Textbook: VII. Week 2: Discussion/Script Analysis. Scene Graphs. ABC of Dramatic Composition. Textbook: VIII. Week 7: Discussion of the Scenes presented. Written Responses Due. Midterm Exam/ with 221 Actors. Week 9: Rehearsal Techniques; Actors -- medium and tools. Textbook: I. Class Project: Endgame. Lab Theatre. Final Exam. Together with THR 221 Intermediate Acting. Video tapes and Prompt Books Due. For anyone who wants it, you may report on any book related to theatre directing in a written fashion. Glossary and lists of Recommended reading are in the Master File 331. Watch the videos on the list for "Film and Drama" (THR 380 W). 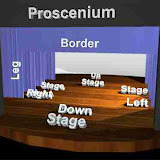 Familiarize yourself with the Intermediate Acting course (THR 221).